Product prices and availability are accurate as of 2019-04-14 01:16:16 BST and are subject to change. Any price and availability information displayed on http://www.amazon.co.uk/ at the time of purchase will apply to the purchase of this product. 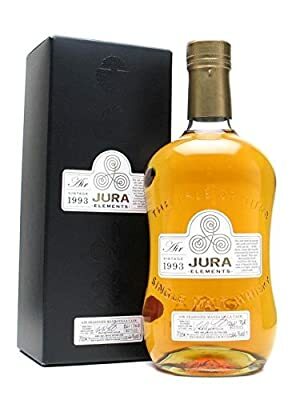 Part of a release of 768 bottles from the Isle of Jura. This Elements expression is dedicated to air, the air used to season the oak casks and their porosity (oh yeah!). The distillers describe them as being "imbued with the purest air". It's a very tenuous link, but thanks to the Manzanilla sherry cask finish, the 1993 vintage from the Elements series is sure to please with its dry, chocolate palate.